Feel like your walls could use a touch of décor to reinvigorate them and change how you feel about a space? 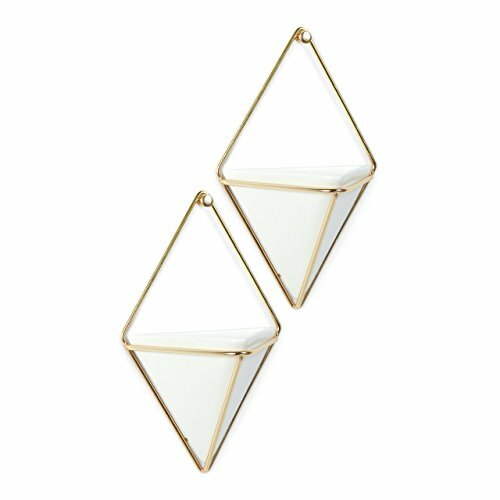 Add some personality to your office, kitchen, or living room with this geometric wall vessel by Umbra. Use Trigg as a planter to add vibrant greenery to your space, in a stylish, unexpected fashion. No matter how you use it, Trigg creates instant visual interest thanks to its sharp, eye-catching shapes, and crisp finishes. Trigg comes in two modern color/material combinations. Concrete with a copper metal wire frame, and white ceramic with a brass wire frame. UNIQUE WALL DECOR THAT GOES ANYWHERE: Small and lightweight, Trigg is great for bathrooms, small accent walls and even narrow walls (beside doorways etc.). For larger wall spaces, combine multiple Trigg units to complement picture frames and other wall décor.